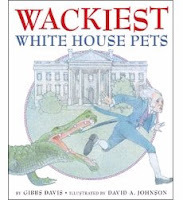 Wackiest White House Pets by Gibbs Davis, illustrated by David A. Johnson. NY: Scholastic Press, 2009. available now. To save time, I'm going to quote the publisher's blurb about the book: White House pets come in every size, shape, and species. What are some of the pets that belong to the world's most powerful men and their families? John Quincy Adams' alligator liked to slither across the White House steps and was fond of chasing the guests! Thomas Jefferson took walks around the garden with his pet grizzly bears! James Buchannan received a herd of elephants from the King of Siam! William Howard Taft, who was fond of creamy fresh milk, kept a milk cow in the kitchen! A list in the back of the book includes almost every presidential pet -- mostly dogs. In fact, there are several historical errors in this book. I can't tell if the author just didn't know -- or the publisher simply wanted to simplify things to keep the word-count down. For a list of some of the errors, check the reviews here. 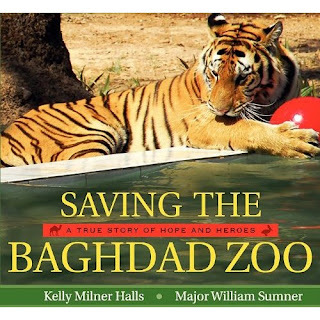 For more Nonfiction Monday reviews, click here and explore. And it occurred to me that it's also close to the birthday of this blog. I've been blogging (journaling?) for over 2 years now. And still manage to post at least 2 to 3 messages a week. On Thursday, the library staff presented me with one of my favorite cakes -- Strawberry Sparkle Cake. Yummy. Saturday after work, my husband and the 9-year-old took me out to dinner. Now, my husband hates to go out to eat -- he prefers my cooking. On the other hand, I insist that on my birthday at least I get to eat something someone else has cooked. Naturally, I had my traditional lobster tail. My husband had a salad, and the 9-year-old copped out and had a grilled cheese sandwich. On the other hand, she took several bites of my lobster tail and has decided she likes it. Oh dear -- she's developing expensive tastes. Both my daughters called from California which was also nice. When we got back home from the restaurant, we had presents and coconut cake. The 9-year-old had found a plaque that said nice things about grandmas and my husband presented me with some dark chocolate non-pariells -- which he immediately 'tested' to see if they were okay. They tested out fine. 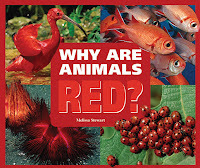 Melissa Stewart has a new series-- A Rainbow of Animals-- published by Enslow, 2009. Available now. I can imagine your first response might be the same as mine -- HUH? Surely there aren't animals that color. Like me, you'd be wrong. 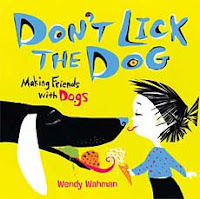 Each book has a table of contents, Words to Know, and one double page photographic spread for each animal with a sentence or two explaining why that animal is a particular color. In the back is a guessing game where the reader can guess why the last two animals are that color. (answers on the last page) A double-page spread showing on maps where these animals live. Ending with four books to read to Learn More (some with even less words and information than this simple book has) and a few websites. Oh, and there's even an index. Oh my -- Everything you ever wanted to know about publishing has been collected (with links) in one place on Nathan Bransford's blog. Naturally, my husband's I-POD worked fine. I was at work. He was at home with the 9-year-old. He sent me a message about the electricity being out at home -- where were the flashlights? Unfortunately, I couldn't see his e-mail, because there was no electricity at work, either. (It's a half-hour drive from home.) Plus, I was having the same problem at work -- where were the flashlights? There used to be rechargeable flashlights at every Information desk, charging away to be ready for emergencies. Except, we had discovered that they gradually died, making them unavailable once we did have an emergency. Maintenance had installed emergency lights in the librarian's office, which has no windows and is dark as pitch when the lights go out. What a nice surprise when they went on. ADM said that we couldn't close. Wait for an hour or so to see what happens. Well, what happened is that we discovered that the emergency lights are only good for a half hour. By the time we were allowed to leave, the office was pitch black, again. Did the customers leave when the computers died? They simply sat at their computer and waited. (laying claim to the one they had been using) I kept seeing lights over by the computers, so I went to see what was going on. They had their cell phones open, shining cell phone light onto their dead computer. Finally most gave up and left. Except for three middle school boys and one lady. The three boys wandered around the library, waiting for the rain (hail/ wind/ storm!) to stop, because they had to walk home. They finally settled in over in a corner by some windows -- watching something on a Blackberry or I-Phone or something. The lady settled down at a table doing the same thing -- watching a movie on her Blackberry or I-Phone or something. Gradually the light through the windows died and it reached 7 pm. Ah. Officially we could close. We turned off every switch that might possibly have been on when the electricity stopped. I drove home to discover I had to detour around a sparking fallen wire near home. 2 am at my workplace, according to staff members who live a few blocks away. And not until 7:30 in the morning at our house. We had expected to get a good night's sleep, since there was "nothing to do" at home. the 9-year-old kept waking us up. She couldn't get asleep. It was too quiet. It was too dark. How did the storms affect your area? Even an Ostrich Needs a Nest, Where Birds Begin by Irene Kelly. New York: Holiday House, 2009. Available now. If you live anywhere near trees, you've probably seen birds' nests. But only some birds of the world build their nests in trees. Some build in Cacti (ouch) , some in holes in the ground or a cliff, and some pile up a compost heap which warms the eggs as the leaves rot. Some birds don't build nests at all, depending on their body or feet to keep the eggs warm. But the strangest of all is probably the bowerbird -- who spends weeks building and decorating and sometimes painting a huge building of a nest -- only to have the chosen female build a simple nest elsewhere to actually hatch her eggs. The lightly colored pen and ink drawings were checked for accuracy by bird expert, Margaret Hart. A world map at the end shows where many of these birds can be found. You would think that an Ostrich's nest would be featured in this book, right? You'd be wrong -- no Ostrich. weird. I have to admit, with no index, it was difficult to determine this, but I searched every page for an Ostrich and found nary a one. A definate OOOPS moment here. One kitten is making all that thunder? Around the corner. Leaping onto the rungs of the stool. Balancing like a gymnist. Swinging around the bar, catching another one, flying off onto the floor into a heap. Yes, our new kitten gets larger and stronger every day. You can't sit at the dining room table without something (someone) attacking your legs or pant leg or skirt. No wonder we call her "Monster cat" -- MC for short. I've got another another free children's writing video for you. This one's called "7 Things Editors Wish Writers Knew" and it's based on our years of discussions with editors at publishers large and small. There are some good tips here that will help writers really impress an editor. The video is waiting for you right here. And the livin' is eeeeeezzzzz. What's a writer to do when the kids are out of school? The writers over at "Through the Tollbooth" are discussing the problems of being a writer and having a life during the summer. Go check it out. Five different writers give five different views. What's your summertime writing plan?